It’s Sunday night at your house. There are tears, meltdowns, “I can’t sleeps”, maybe stomachaches or headaches and an emphatic… “I don’t want to go to school tomorrow.” Your child can’t give you any logical reason for their feelings, but they’re so uncomfortable that their emotions are totally running the show. You feel like you’re always walking on egg shells. You’re a puppet and your child is the puppet master. Your entire family is constantly responding to the intense whims of their feelings. And you’re so, so exhausted with it all. Your child comes home from school after learning about the holocaust in Social Studies. They share with you that they are overwhelmed by sadness for the people who died. They’re carrying the sadness of the event as if it happened to them. The next day, they catch a glimpse of the news as they walk through the room. Even though you try to be vigilant about quickly changing the channel, they see a story about a murder. They’re so frightened they’re unable to sleep in their own room for the next two weeks no matter how much you bribe or cajole them. On the third week, they agree to sleep in their room… but only if you stay with them until they fall asleep. You’re stuck in a loop that’s stealing your child’s happiness. You’ve tried everything you know and nothing’s changing. Understanding this next piece is the key to beginning to decrease your child’s meltdowns. Everybody has a natural tendency to default to a specific emotion when they are stressed. This default emotion’s volume gets turned up loudly whenever we’re under emotional distress. It can shift at times, but I’ve found that one default emotion usually remains primary for most people throughout life. Learning what it is and how to manage it is key. Sometime soon, we may even find a genetic link to this since it appears connected to our experience of the fight, flight, or freeze response. That is when we’re under distress or perceive danger our brain responds with a signal to fight, flee or freeze. Think for a moment, when you’re triggered what are you most likely to feel? Everything is aligned against me. There’s little to no opportunity for things to improve. Why try? Things outside of me will cause me emotional or physical harm. I’m driven to fight for what I feel is right. For me, it’s anxiety. When I’m triggered, my natural tendency is to hide, to avoid, to overthink and to sprint back to my comfort zone. We all know people who default to anger. They’re pretty easy to recognize. They argue, fight and get in power struggles. They also might yell, throw things or hit. What about your child? Which feeling tends to take over when they have meltdowns? Understanding this is key to beginning to help them. Knowing that there’s nothing wrong with your child. Knowing that they aren’t acting out for attention, to manipulate you, or to get back at you. They’re not stepping on your last nerve for fun. Something has triggered them. Their default emotion has taken over the driver’s seat and they do not yet have the skills to regain control. They need your guidance so they can understand what’s happening, learn what to do to better tolerate uncomfortable emotions and begin to calm themselves. I’ve seen first hand the magic that happens when kids understand that they have one emotion that get’s bigger for them. That it’s simply a signal that they’re distressed. They learn about themselves, how they work and this self-awareness increases their self-acceptance. They know that there’s nothing wrong with them. And their emotions are able to pass more quickly when they aren’t piling shame and guilt on top of themselves. When the parents I work with privately and in my Calming Compass program understand their child’s default emotion, they can show up in a different way for them. Instead of yelling, losing their cool, bribing, or threatening with consequences, they are able to fully show up with the intention of connecting with their child during emotionally intense moments. After working together for 6 months, one Mom told me that when her daughter gets overwhelmed by anxiety they handle it in a entirely new way. When her daughter comes to her and shares why she’s upset, she uses the Communicate to Connect steps she learned to move through the emotions with her daughter. She’s mindful of her own body language and non-verbal signals. 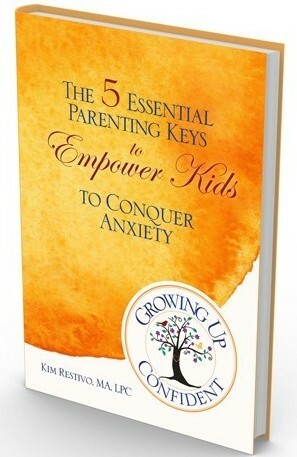 She sits with her being present and compassionate to her daughter’s experience of anxiety. She asks questions to better understand her daughter’s perspective and she empathizes with her feelings. And she said, with a bit of astonishment in her voice, that now the anxious moments don’t last as long as they used to. Her daughter’s able to be with her feelings and move through them quicker using the techniques and strategies they learned in our work together. What would be possible for your family if you knew what to say and do when your child was emotionally struggling? What would shift if your child better understood their default emotion? To help you with this, I’ve created the Feeling Finder. A fun, free, downloadable activity for kids ages 5-12. While you probably know your child’s default emotion, just telling them most likely won’t help. After they complete this activity, they’ll be able to clearly see their “big feeling”, grow their self-awareness and emotional intelligence and begin to decrease meltdowns. Grab this special activity below. Join the Newsletter and receive your FREE Feeling Finder Activity Guide. Thanks for this article – it will be a great help for parents in coping up and understanding their child. Most kids go through emotional breakdowns and providing ways to cope up with it will be good for the family’s relationship with each other. Glad you enjoyed the article, George. So helpful! I’m absolutely sharing this. I always think of the three not two Fs: Fight, flight, freeze. And it makes so much sense to match them with the emotions of anger, fear, and sadness!